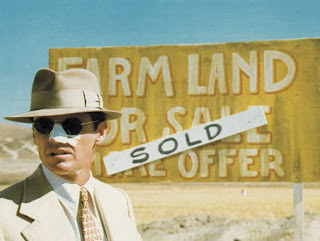 “Chinatown” has been touted by many pundits as the best screenplay ever written. It’s a unique Hollywood concoction – a gunshoe thriller in the classic noir genre, but also modern and beguiling. It’s a twister that unravels to reveal a salacious melodrama motivating a big business urban conspiracy. Jake Gittes is an L.A. private detective in the 1930’s. One day a woman named Evelyn Mulray enters his office and hires Jake to spy on her husband Hollis Mulray whom she suspects of cheating. Jake is initially hesitant to take the case as he honestly explains that she’s better off not knowing, it would cause more pain for her. Mulray is insistent and Jake takes the case. Jakes follows Mulray around for several days. He discovers he’s the chief engineer of the city’s water department. There’s a major drought in the city of Los Angeles and Mulray is in the middle of a heated debate about an expensive new dam project. Despite all this, Gittes’ investigation reveals a conspiracy involving the city dumping precious water in secret overnight. Gittes performs his job and captures Mulray’s rendez vous with a young girl. But when Hollis Mulray turns up dead the next day, and a different woman shows up claiming to be the real Evelyn Mulray, Gittes realizes he’s been set up in an elaborate murderous plot. With his pride and reputation on the line Gittes retraces his steps to uncover the conspiracy. He develops a relationship with the real Evelyn Mulray (Faye Dunaway). Evelyn, a good-looking erudite woman, with an emotional detachment to the mysterious goings-on, intrigues Jake and he takes her case to find the other woman who was seeing her husband. No one seems to be telling the truth, not even Evelyn, and as Gittes moves through the city of Los Angeles, the stakes get higher and higher. When he meets Evelyn’s father Noah Cross (John Huston) who owns the water company, we realize the conspiracy is as personally motivated as it money-driven. “Chinatown’s” byzantine plot expands larger as the film moves along becoming a big business conspiracy about the creation of modern-day L.A. and a searing melodrama with operatic plot twists. I’ve seen the film several times and it still confounds me. The mechanics of the plot, like “The Big Sleep”, are notoriously difficult to follow. And though I do get lost each time I watch it, I’m comforted by the intermittent expository lines Towne gives Jake to say which always helps me catch up. Roman Polanski directs the film to perfection. Nobody has shot Los Angeles better than Polanski and his DOP John Alonzo. For a film noir, they chose to the shoot the film as bright and sunny as possible. Film noirs are traditionally shot in shadows and underlit to compliment the secretive elements of the genre, but Alonzo and Polanski hide nothing from us. They choose to beautify Los Angeles and bathe their characters in the brightest colours. Polanski’s camera follows Gittes very closely the entire film, much of it behind his neck. With a 2.35:1 wide angle frame we are able to see everything Jake sees and still see Jake’s wandering eyes and furrowing brows up close and personal. The handheld work is subtle. It’s so close to everything it becomes part of the action, but without the jerky movements that overtly remind us a camera is there. Sometimes the camera is so close to the actors we can feel it getting in the way. Watch the very end, after the shootout in Chinatown. When Jake and the cops run up to the car and see the damage done Nicholson actually knocks the camera. It’s unintentional but unobtrusive and natural to the film. “Chinatown” never tires. It contains so many indelible characters and situations, an unraveling plot that gets bigger and bigger as it goes along, beautiful locations and a modern quality that continues to resonate today. In fact, it’s a good companion piece to “Enron: The Smartest Guys in the Room”. Seriously. Check it out. This is one of my favorite movies of all time. It is without a doubt a classic. Raymond Chandler once said a classic was something that "exhausts all the possibilities of its form." If anything can be said to do this for the detective film, Chinatown is it.